Electronic waste, commonly referred to as e-waste, is banned from all Vermont landfills. 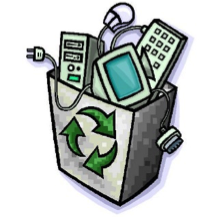 Electronic waste contains heavy metals such as cadmium, lead, mercury, and PBDE’s which if disposed of improperly can leach out polluting the environment and causing harmful health effects. Electronics also contain precious metals such as copper and gold which can be salvaged, along with much of the plastic. Recycling not only reduces the amount of waste going to landfills but also reduces the rate at which we need to mine these finite resources. Other electronic items such as VCRs, DVD players, radios, stereo equipment and others are also accepted, but there may be a charge. Check with the facility first.